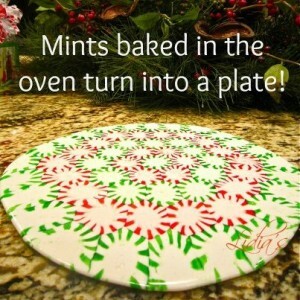 DIY Peppermint Candy Platter | mizzeliz – working for you..
Open peppermint candies and arrange them in whichever pattern you’d like on the parchment paper. Bake at 350 for 13-17 minutes. Pull it off the pizza pan after 2-3 minutes & put it flat on the counter to cool (still on the parchment paper). Allow to cool fully and pull off the paper. VOILA! Plate made from candy.